All of us, at some point in our lives face difficult moments, which make us feel overwhelmed, as if things were out of control and we feel threatened by defeat, shame and despair. When we face these battles, our greatest defense is to have a strong faith in the Almighty God, based on the Word of God. Because then, we can overcome every problem that arise in life and emerge victorious. If there is someone who came out victorious, it was King David before Goliath demonstrating confidence and security, 1 Samuel 17: 45-47 "Then David said to the Philistine, You come to me with sword and spear and javelin, but I come to you in the name of the LORD of hosts, the God of the armies of Israel, whom you have provoked, the LORD will deliver you this day into my hand, and I will conquer you, and cut off your head, and give the bodies of the Philistines to the birds today. 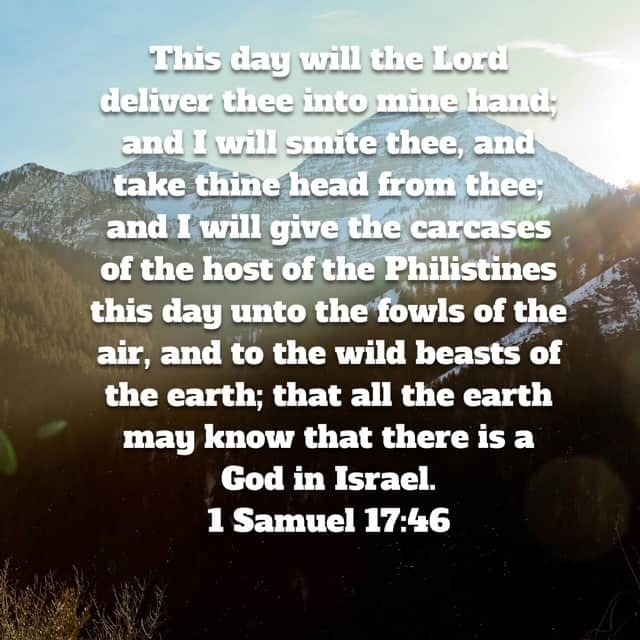 from heaven and to the beasts of the earth, and all the earth will know that there is a God in Israel, and all this congregation will know that Jehovah does not save with sword and spear: for the battle is the Lord's, and he will deliver you into our hands. " Wow, what a most impressive statement, that shows a powerful faith, especially in those who have their confidence. And what application today has the story of a shepherd of sheep and a giant. What happens is that we all have our own goliaths in life and they come in all sizes and shapes. Goliaths can be a person, or a habit, of a relationship, or a situation that makes you feel overwhelmed. It is not that you are not going to suffer afflictions or that you are not going to bleed, but in the end you will emerge victorious. 1. Remember the past victories. 1 Samuel 17: 32-36 "And David said to Saul, Do not let any man's heart faint because of him: your servant will go and fight against this Philistine." Saul said to David, "You can not go against that Philistine to fight with he, because you are a boy, and he a man of war from his youth. "David replied to Saul," Your servant was a shepherd of his father's sheep, and when a lion or a bear came and took some lamb from the herd I went out after him, and he struck him, and delivered him out of his mouth, and if he rose up against me, I would take his jaw and strike him and kill him: he was a lion, he was a bear, your servant killed him; and this uncircumcised Philistine will be like one of them, because he has provoked the army of the living God." When David met with King Saul, he did not focus on the opposition and immediately began to think that it was what he did to have a victory: I killed a bears and a lion. And if he could kill a bear and a lion. If God gave them into my hands, God will also give into my hands this uncircumcised Philistine who provokes the living God and desecrates the very name of God. So, remember the victories that God has given you in the past. 2. I must ask myself: Why do I want the victory?. To boast ?, or because I'm tired of dealing with problems ?, or because we seek our own benefit ?, or because we want things to be easier ?, that everyone loves us, that everything goes well ?. The truth is that God does not try to make everything easy, but rather, seeks to make us more like Jesus. David did not tell the King, I will tell him what we are going to do: if he gives me his daughter in marriage, enough money and frees my family, then I will get rid of Goliath. David did not negotiate with King Saul. In his conversation with him, he never mentioned the money, or the daughter of the king or the freedom of his family. But he mentioned what dominated his thought: let's get rid of this uncircumcised that is challenging the sovereignty of the God of Israel. 3. The faith that wins is a faith that rejects the discouraging words of others. David goes to the battle front sent by his father to see if his brothers were okay. 1 Samuel 17: 26-30 "And David spoke to those who stood by him, saying, What shall be done to the man that kills this Philistine, and will take away the reproach of Israel? For who is this uncircumcised Philistine, that he may provoke to the squads of the living God, and the people answered the same words, saying, "So shall it be done to the man who defeated him." When Eliab heard his elder brother speak to them, he burned with anger against David and said: what have you come down to? And who have you left those few sheep in the desert? I know your pride and the malice of your heart, that you have come to see the battle. "David replied," What have I done now? Just to talk? And turning away from him towards others, he asked in the same way, and the people gave him the same answer as before. " According to this story, David goes to the front and meets his brother Eliab. Whoever rebuked him and if he had listened to him, would have returned home. What's more, if he listens to him, he would have missed the opportunity to take an important step. In the end, he also refused to listen to King Saul's comments. 1 Samuel 17: 33 "And Saul said to David, Thou can not go against that Philistine, to fight with him: for thou art a youth, and he a man of war from his youth." So let's be very careful who we listen to. 4. A true faith is one that recognizes the true nature of the battle. The true nature is that God fought against other gods, there were Dagon and Belzebub and Jehovah the true God. And this is the real reason why we read in him. 1 Samuel 17:47 "And all this congregation shall know that the LORD saveth not with sword and spear: for the battle is the Lord's, and he will deliver you into our hands." David was saying in other words, that this battle is between his gods and our God. I am going to show you that God is God and that he will take care of these gods. There is no doubt that what the enemy wants is to try to stop the fulfillment of our purposes and dreams that God has placed in us. But if we understand what is happening, the situation becomes clearer, and we will no longer worry about ridicule, or criticism. Therefore, our focus should be on God, trust in Him and then we will see victory in our lives. That is why the most important time is that we spend alone with God. That's where the battles are won. Battles are won in our minds, hearts and spirit. Believing that God is capable, therefore, victory is a fact. Let us pray: "Lord, thank you for your love for us and for the stories about your servants, who were men and women like us, who trusted you and you give the victory, I pray that the Holy Spirit will give us the victory and thus give glory and honor to God, in the name of our Lord Jesus Christ, amen. "